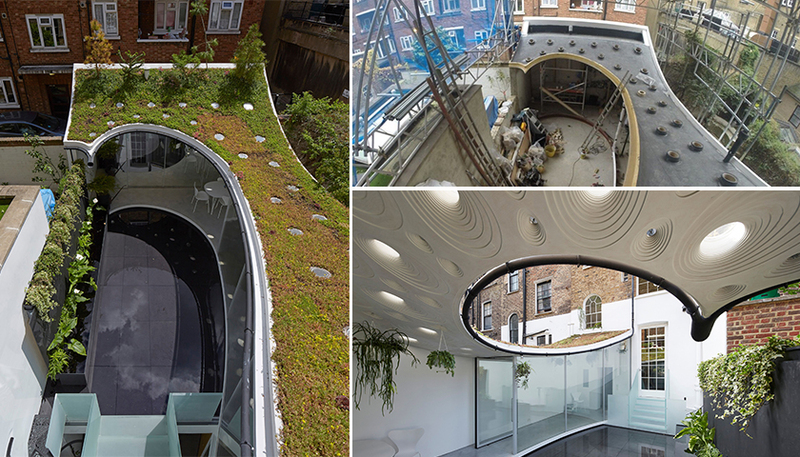 Kemper System tops London’s best new Extension with waterproofing systems ..
Kemper System has helped to create an award-winning home extension, featuring a unique swooping roof structure. Designed by architects Tonkin Liu, the ‘Sun Rain Room’ forms part of the restoration of a Grade II Listed Georgian townhouse in London. The building is also home to architects Anna Liu and Mike Tonkin and provides a studio for their practice. Kemper System’s Kemperol 2K-PUR was specified to waterproof a main feature of the extension – a curved, 10m-long roof, which has been constructed above a new garden room on the ground floor. Structurally, the roof is unique as it has been built using layers of 6mm plywood, which sandwich an insulating core and allow for 25 circular skylights. Odourless and solvent free, the Kemperol 2K-PUR liquid waterproofing system was installed by north-London based roofing contractors Liquid Waterproofing Ltd. It was applied directly onto the 110m-thick plywood structure, in a single wet-on-wet process using a reinforcement fleece. Once cured, the system formed a seamless, elastomeric waterproof membrane which bonded directly to the substrate. After the Kemperol 2K-PUR had been applied, it was topped with richly planted sedum. However, as parts of the roof’s perimeter remained visible, Kemperol Reflect was also applied. This is a white waterproofing system comprising special liquid synthetic properties which reflect UV and infrared radiation away from the roof, ensuring the surface temperature remains cooler than when using traditional darker roofing materials. The Sun Rain room has won multiple awards including being named the overall winner of New London Architecture’s prestigious Don’t Move, Improve! awards in 2018, which showcase the capital’s best and most innovative new home extensions. It has been described by the architects as ‘a good place to be on a bad day’ as rainwater gathered at the top of the townhouse falls through a pipe, following the roof’s curving leading edge to a spout over a long rainwater harvesting tank. The tank floods the patio at the push of a button, transforming it into a reflecting pool.